Great first release by The Secret from London/UK. Later they changed their sound and played more new wave/powerpop. I'm still in love with this one after all the many moons i own this record. ...of course this was later re-worked by the cast of The Young Ones for their theme song. Rik Mayall saying "...shouldn't be afraid" - hilarious. Respect for the original though I prefer the Secret's later stuff. Brilliant been looking for this for years! bought it on a market stall for 50p and ended up losing it!! Classic early britpunkpop along with Battersea (anyone got that one)?!! Hi, I'm Claudio From Peru. 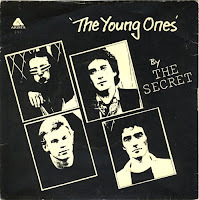 I've recently heard the single the young ones of the secrets on youtube and I've been searching for it (is the best version of all!!!). the link is broke on your blog, please could you fix it? I'll be very thankful.